I love you more than all the raindrops falling from the sky . . .
and all of the puddles we splashed in. I love you more than all the blooming springtime flowers . . .
and all the dandelions we made wishes on. Views of love are forever changed with the wonderful addition of a baby to the family. Parents come to realize that their love is boundless and only keeps growing more than they ever thought possible-more than all the raindrops in the sky, more than all the sand on the beach, and more than all the stars in the sky, proving that the love of a parent is unconditional and unparalleled. 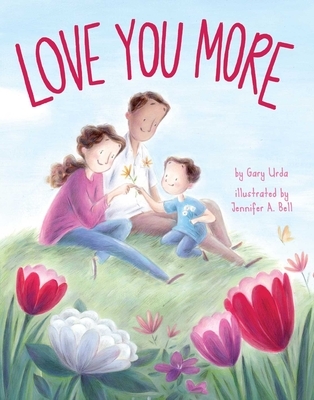 Parents will love sharing this sweet story with their child! Gary Urda is the proud father of three wonderful young men: Tyler, Sean, and Luke. He lives in East Northport, New York, with his beautiful wife, Nicole, and their children. The Urdas enjoy game nights, soccer, and doing things together as a family. Jennifer A. Bell is an illustrator whose work can be found on greeting cards, magazines, and in over two dozen children's books. She studied fine art at the Columbus College of Art & Design before becoming a children's book illustrator. She lives in Toronto with her husband, son, and their cranky cat.